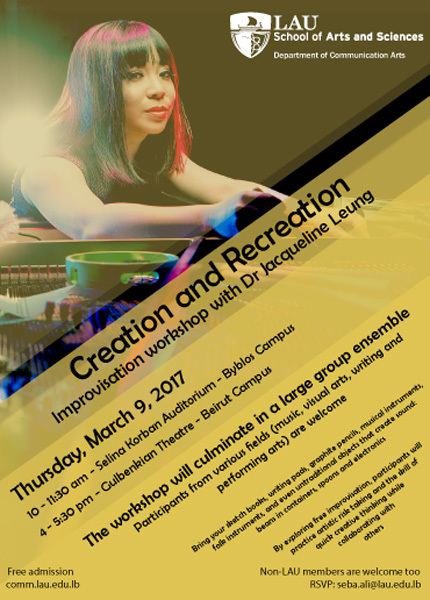 The Communication Arts Department at the School of Arts and Sciences is organizing an interactive workshop exploring free improvisation with participants from various artistic practices such as music, visual arts, writing arts, and performing arts. The workshop is open to participants of varying experiences. Participants are encouraged to bring musical instruments, folk instruments, and even untraditional objects that create sound (i.e beans in containers, spoons, electronics etc.). Participants are also highly encouraged to bring sketch/writing books, graphite pencils, and erasers for writing and drawing. Musicians and other artists today are demanded to be extremely creative and quick thinkers as we create art and respond to an eclectic, competitive and evolving contemporary art scene. By exploring free improvisation, participants will practice artistic risk taking and the skill of quick creative thinking while collaborating with others. Participants will learn about graphic score notation, the free improvisation movement, and current interdisciplinary artistic practices. Participants will first be invited to try a variety of fun improvisation activities using their preferred medium (music, visual arts, writing, or theater) in a small ensemble. Participants will then split into groups according to their discipline and the workshop will culminate in a large group ensemble improvisation. All are welcome to attend. To register, please send an email to seba.ali@lau.edu.lb.